Calendar Magic is an easy-to-use program that is entertaining, informative, educational and of equal applicability in the home and in the office. Calendar Magic has been tested on Windows 10, 8, 7, Vista, XP, Me, 98 and 95, and has been reported to run without problems on other versions of Windows. The main features of Calendar Magic are given below. Translations of this page into other foreign languages are available ‒ Belarussian by Vicky Rotarova, Dutch by bespaardeals.nl, Hungarian by Szabolcs Csintalan, Italian by Calvina Bice, Romanian by Irina Vasilescu, Russian by Alex Marchenko, Spanish by Boris Konopka, Swedish by Weronika Pawlak, and Thai by Ashna Bhatt. Full year and individual month Gregorian, Afghan, Armenian, Baha'i, Balinese Pawukon (full year only), Balinese Saka, Bangla, Chinese, Coptic, Egyptian, Ethiopic, French Revolutionary, Hebrew, Hindu Lunisolar (3 variants), Hindu Solar, Indian National, Islamic Arithmetical (8 variants), Javanese Pawukon/Pasaran, Julian, Revised Julian, Parsi Fasli, Parsi Kadmi, Parsi Shenshai, Persian (2 variants), Sikh Nanakshahi and Vietnamese calendars. A user option is provided to choose between displaying/printing calendars showing each week starting on a Monday (in line with the ISO 8601 international standard), on a Sunday for North American users, or on a Saturday for Middle East users. Various types of planning calendars. “Dual Calendars” – full year calendars in various calendar systems which show, not only the months and days for a year in any one of the calendar systems, but also the corresponding Gregorian dates. A month-by-month, side-by-side comparison of any two of the 26 calendar systems listed above. The display remains synchronised as you change day, month and year values in either calendar system being viewed. Again, users may choose between displaying each month with weeks starting on a Saturday, Sunday or Monday. A "Calendar Collector" – how long will it take to collect all 14 possible Gregorian Calendars? Date conversions among the 26 calendar systems listed above, plus conversions to Aztec Tonalpohualli, Aztec Xiuhpohualli, Balinese Pawukon, Thai solar, old Hindu Solar, old Hindu Lunisolar and Mayan date formats. 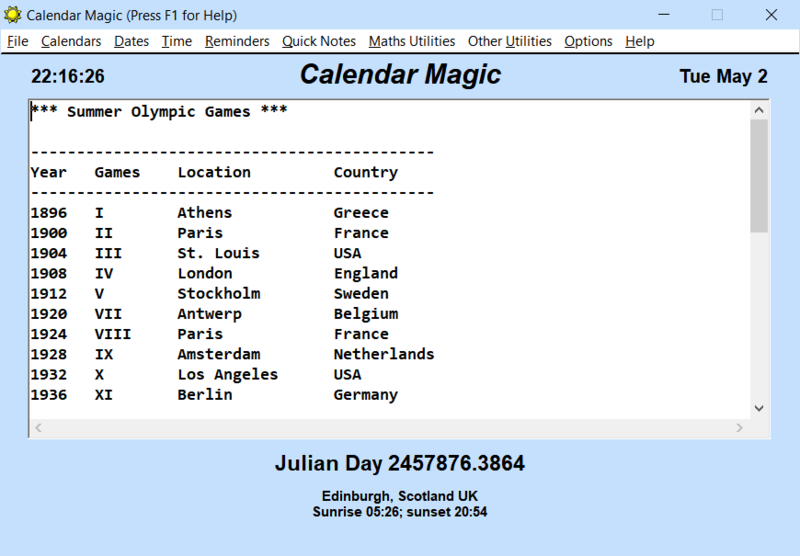 Julian day value, day of week and day of year information is also displayed. For Gregorian dates, many other facts are displayed, such as modified Julian day value, Lilian day value and Rata Die day value, and year related information including Roman numeral form, Dominical Letter(s), Dionysian Period, Julian Period, Golden Number, Solar Number, Roman Indiction and Epact. Various special days are also recognised (e.g. Halloween), as are modern Olympic years, Commonwealth Games years, European Athletics Championship years, and World Athletic Championship years. Conversion of British sovereign regnal dates to historical Julian (years beginning on Jan. 1) or Gregorian dates, as appropriate. Lists of Western Christian festivals, Eastern Orthodox festivals, Hebrew festivals and Islamic festivals for any (Gregorian) year. In addition, Hindu festivals may be listed for any year in the range 2000 to 2043, Baha'i festivals from 1845 onwards, Balinese Hindu festivals from 1816 onwards, Buddhist and Chinese festivals from 1645 to 3000, and Sikh Nanakshahi festivals from 1999 onwards. Observed Days for any year from 1990 for over 230 countries and dependencies worldwide. Date Detective command button to tabulate the weekday on which a specified Gregorian date d/m occurs for each of the years in the specified range y1 to y2. In Which Months? command button to list, over a range of years, the months in which a specified day of the month falls on a specified weekday. The ability to create, display, update and delete reminders for events (birthdays, anniversaries, meetings etc.) for this year , next year or every year . When Calendar Magic is started up, both visual and audible warnings are given for imminent events (those occurring within the next seven days) for which reminders have been set. In addition, a calendar for any month, in this year or next year, may be displayed with day numbers highlighted in red for those days in the month for which reminders have been set. Left-clicking on any red day will cause the reminder(s) set for that day to be listed. Out-of-date reminders are also automatically purged by Calendar Magic and appended to a text file, purged.dat, for later reference, if needed. A multi-sheet Quick Notes facility for holding miscellaneous plain text items. An alarm clock facility for defining an alarm for a given time on a given date. A user may specify the duration of the alarm which may be repeated, after a specified quiet time, up to five more times. A separate “stopwatch” function is also provided. A “countdown timer” for counting down, second by second, any specified time period to zero. “What Time is it in?” to calculate the current time and date for a world-wide location and to identify Time Zone abbreviations. “World Clocks” to display simultaneously the local times at any 12 world-wide locations. Conversion between normal and French Revolutionary time. This is your life information including the day of the week on which you were born, number of days you have lived, your Zodiac sign and the day of the week on which your next birthday falls. Your Chinese age and your date of birth in many other calendar systems are also displayed. Continuously updated display of date, time and Julian day. Number of days between any two dates in the Gregorian calendar (and number of working days). Calculation of the date n days, weeks, months or years before or after a specified Gregorian date, where n is a whole number. An analysis of the Gregorian 400-year cycle, after which the Gregorian calendar repeats itself. Special Julian to Gregorian change-over calendars for Bulgaria, Czechoslovakia, Denmark, Estonia, France, Great Britain, Hungary, Ireland, Italy, Luxembourg, Norway, Poland, Portugal, Romania, Russia, Spain and Sweden. Dates and times of equinoxes, solstices and Moon phases for any year from 1582 to 3000. Solar and lunar eclipse data for any year up to 3000. Sunrise and sunset information for any date up to the end of 2200 for 18000 locations across the world. Moonrise and moonset information for any date up to the end of 2200 for these 18000 locations across the world. The global distance between any two of these 18000 locations across the world. Current local time and date in any of these 18000 locations, plus interpretation of time zone abbreviations. A Unit Converter for converting among 1722 units of measurement in 83 different categories including length, area, volume, mass, temperature, time, velocity, energy, power, pressure, computer storage etc. A Time Calculator for performing simple arithmetic on times. A Geometry Calculator for evaluating key attributes (area, perimeter, volume, surface area etc.) of various 2D and 3D geometric objects. A Prime Calculator for investigating various aspects of prime numbers. A Factor Calculator for factorising numbers with up to 100 digits and for evaluating the HCFs and LCMs of lists of numbers. A stack based Scientific Calculator with a visible stack. An Equation Solver for finding the roots of quadratic, cubic, quartic and quintic polynomial equations. An Expression Calculator for calculating the values of arithmetic expressions entered in normal (infix) form. An Interval Arithmetic Calculator for performing arithmetic on approximate values specified as numeric intervals. A Statistics Calculator for performing various statistical procedures. A Fraction Calculator for evaluating exactly expressions containing integers and fractions. A Continued Fractions Calculator for evaluating continued fractions and for converting arithmetic expressions of various types to continued fractions. The solution of Pell’s equation is also supported. A Big Numbers Calculator for performing arithmetic operations on very large numbers. A Number Base Converter for converting numeric values between different number bases. An implementation of a method for solving the Travelling Salesman problem. A Financial Calculator for performing various financial calculations. An Ovulation Calculator for predicting the dates of maximum fertility days. A Pregnancy Calculator for calculating the due date of a pregnancy and other pregnancy related dates. A Blood Alcohol Content (BAC) calculator. A Body Mass Index (BMI) Calculator. A Body Shape Index (ABSI) Calculator. A Paper Weight Converter for converting between metric paper weights and American paper basis weights. Colour customisation of screen backgrounds, non-button text and button backgrounds. Support for printing any output displayed, and/or copying it to another program via the Windows clip-board using the usual Ctrl+A , Ctrl+C, Ctrl+P, Ctrl+X and Ctrl+V keyboard commands.